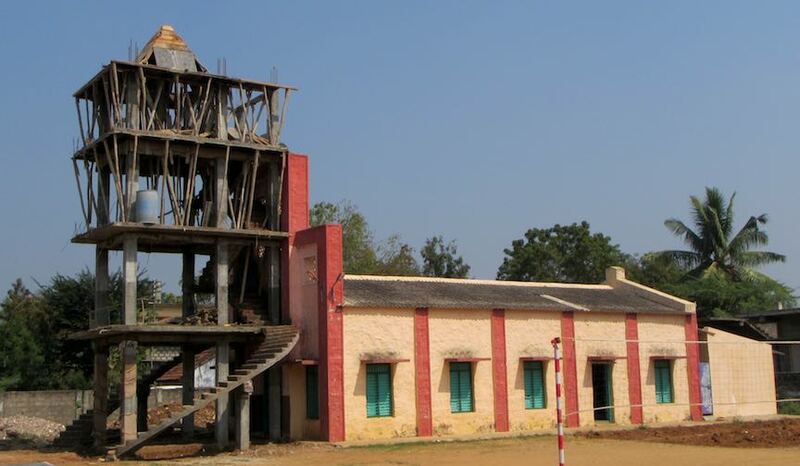 “Literally” building the church in India | Walk with us! The new bell tower going up at Sacred Heart Church in Vempada. Fr. Jojappa Chinthapalli, SCJ, is a member of the district council and pastor of Sacred Heart parish with its three sub-stations. It is usually referred to as “Vempada,” the village in which the central church is located. Last fall the US Province gave a grant of $5,000 to construct a bell tower which, as you can see from the photo, is well underway. In fact, Fr. Jojappa was eager to get back from the district council meeting last Thursday by 7:00 pm as he had to round up about 30 people to help provide labor on Friday to get the roof tiles up to the men doing the actual work. This is not the only construction project in the parish. Our North Italian Province is providing funds to construct a parish/community house. Presently Fr. Jojappa and Br. Suresh, SCJ, arenliving in a rented house. Suresh just completed his regency year with Fr. Jojappa and will be one of four regents to be ordained deacons on February 21 at Gorantla — our minor seminary about 60 to 90 minutes from Eluru, depending on traffic. Construction has not yet started on the parish house though it is hoped it can begin shortly as construction season is about to start. As the weather gets hotter I presume that it is similar to what takes place in cities like Phoenix in the United States where as summer approaches it is simply too hot to work in the middle of the day. I have not seen plans for the community house. At present it is a community of two but the parish could easily use another priest especially with the limited pastoral support the scholasticate is able to provide at this time. I will be visiting the parish a week from Sunday. It’s an easy day for me to go as several of the scholastics go there every Sunday along with a couple of Dominican Sisters from Eluru to assist in the liturgy at the principal church. When I say “liturgy” this includes rosary and adoration before Mass. Of course the Mass will be in Telugu so my participation will be limited. Last Sunday I asked Br. Harish to use their new camera [Fr. Tom used frequent flyer points to get a camera for the formation community] and take some pictures. Here is one of some of the boys and girls, along with Harish, after Mass following some activities conducted by our SCJ brothers and the Dominican sisters. This Sunday I am going to ask one of the brothers to take some photos at a different parish ministry site. All the students have some sort of pastoral work and for the most part it is done on Sunday mornings. 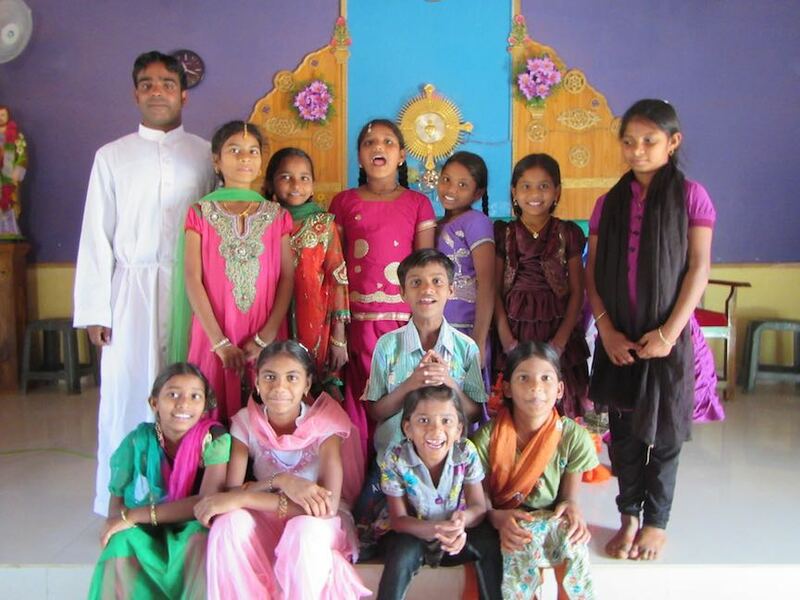 Some of the students go into Eluru or to the surrounding villages and often are involved in teaching catechism.